The girls in Julia Margaret’s family were known as “the beautiful Miss Pattles”— all except her. Plain, short, and clever, Julia Margaret would eventually create her own beauty in the photographs she produced. Susan Goldman Rubin follows the groundbreaking photographer from her privileged childhood in Calcutta and Versailles to her role in bohemian salons in England, whose luminaries — Alfred Tennyson and many others — would later pose for her portraits. 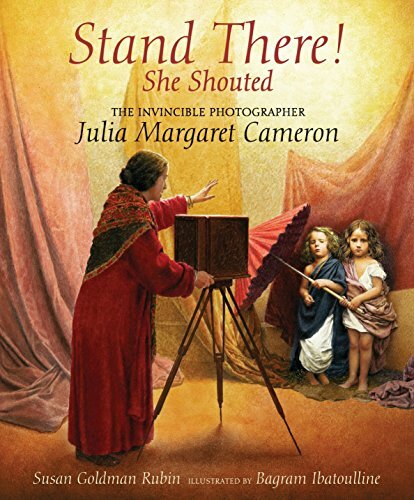 Commanding and eccentric, Julia Margaret Cameron persuaded children and friends to dress up and hold still for the long sittings needed to stage scenes based on literature and myth. Featuring more than a dozen vintage photographs as well as gorgeous illustrations by Bagram Ibatoulline, this engrossing biography illuminates the very beginnings of photography —and the determined woman who made the art form her own.